I feel like I've been reviewing with my classes so much lately! In Geometry, my students just took their test on quadrilaterals. 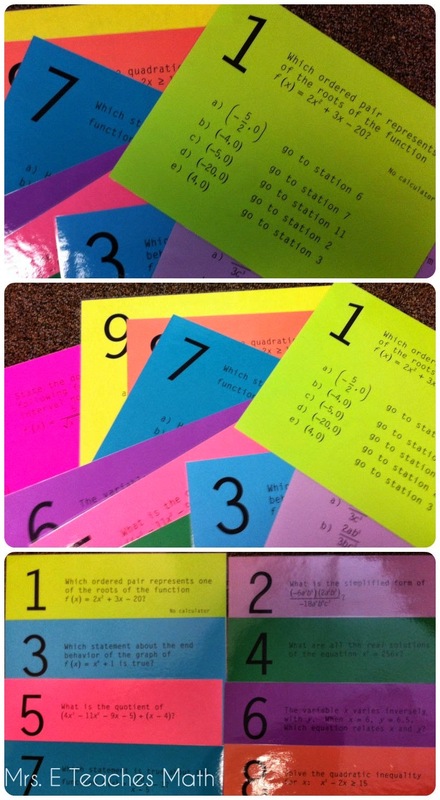 I have several activities in my files, but I wanted to do something to review that kept the kids active. It's been such dreary weather here lately that I'm sure they would start falling asleep if they weren't up and moving! I decided to use a stations maze. 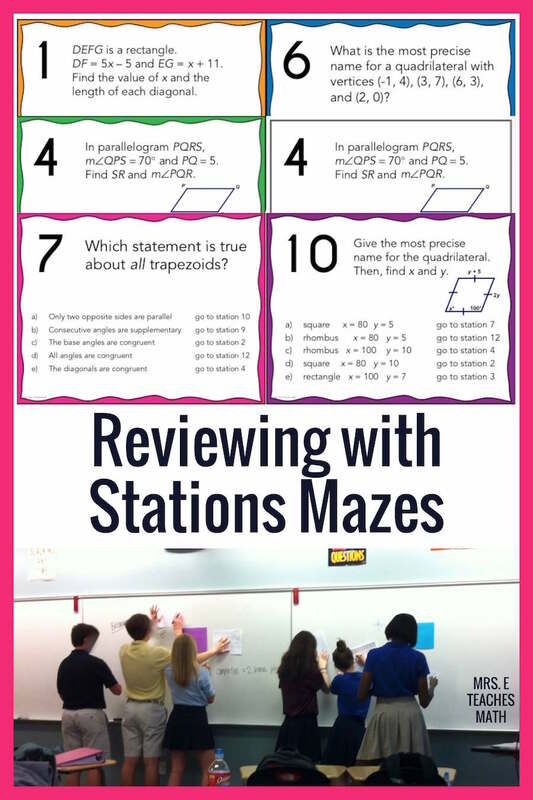 In a "stations maze", I create stations with a multiple choice question on each station. The answer to each station points them to the next station they should visit. The students keep track of the order that they visited the stations and I only check the order of the stations. I hung the stations up all around my room on the walls and the whiteboards. I don't hang the stations in order; the kids think I do this to be sneaky. I try to alternate problems that take longer to solve with quick ones. That way, the kids aren't bumping into each other at every station. It also helps keep the groups moving throughout the classroom instead of congregating around one or two stations for a long time. I like to hang some of the problems with longer calculations on the whiteboard with a marker underneath. This is my Quadrilaterals Stations Maze that I have listed on Teachers Pay Teachers. 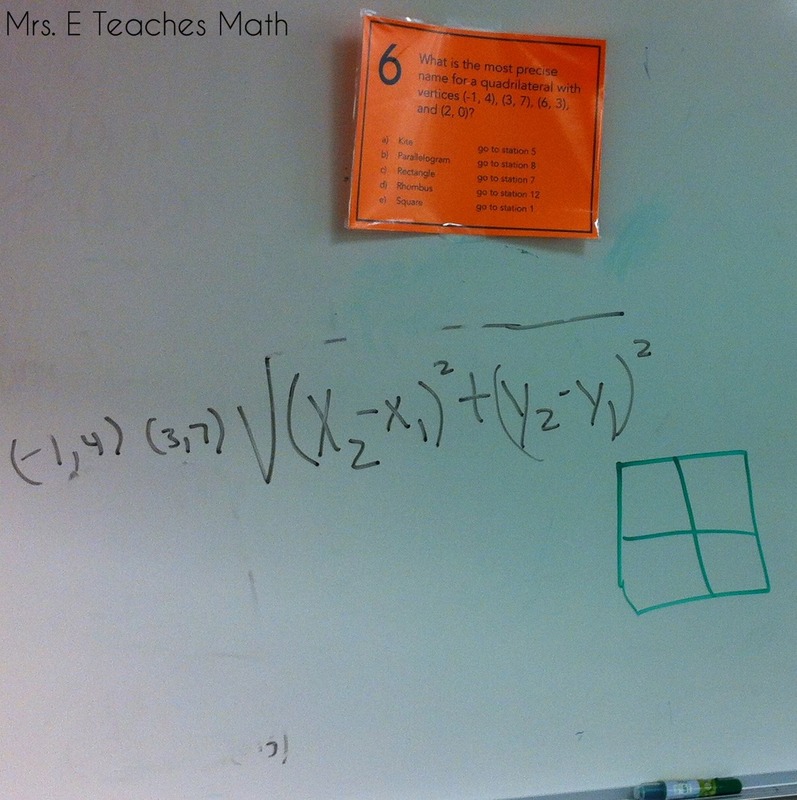 In Algebra 2 Honors, we had been reviewing polynomials for a few days (we had gotten ahead of the course pacing). I decided to do a stations maze to break things up and review a little. The maze I made has some review problems interspersed; I like to keep them on their toes. This maze is in my free resource library. 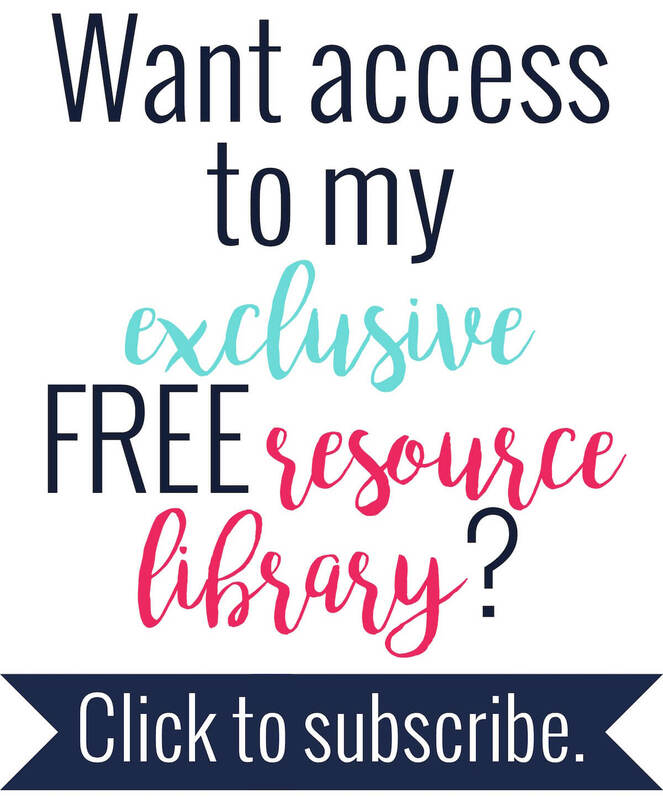 Don't have access? Sign up here! Just wondering, how do you set up a maze for any topic? Is there a systematic way to doing this so that all the pathways are accounted for? We just use different measurements and look at slightly different content material here in Australia. Any tips would be great. I have a basic template that I made that I use. Basically I use PowerPoint and use textboxes for everything. Then, I decide the order that I want the solution to be in. For instance 1 -> 4 -> 3 -> 9, etc. Then, I start typing those numbers next to the correct answers. Once I've finished everything, I go back and type random numbers for all of the incorrect answers. I do not worry about any of the wrong paths, they will work themselves out. I only worry about the correct path. If there's anything specific you would like me to make or changes to something existing I would be glad to do it for you. I know that some things are the same, but with slightly different tweaks. My store is closed right now, but I plan to re-open it in about a year. I take "custom orders". If I make something for you, I send it to you to edit, and you get the edited product for free, as long as I can sell it in my store for later. I have a few people that have gotten several things for free this way. I just need some lead time, as it is too difficult for me to make something and have it ready in the next day or two. You know how it is as a teacher; we can get very busy making lesson plans and grading! How do you keep the kids from just following each other around the room? Ms. B, typically, I copy them on two different colors of paper. Then, I assign different groups different colors. Each group has a different starting point (I usually don't have students start on station 1). That spreads the kids out a bit. Also, I give them answer sheets and require that they show all of the work to get the answer. Sometimes I give a small incentive for the first X groups that finish (a small piece of candy, allowed to pack up before the bell, etc). The number order for everyone will be the same, but their work along the way will look different. Hi! I know this is from super long ago, but I tried to download the Polynomials stations maze, but the link didn't work. Is it possible for you to email it to me? cdepweg @ gmail dot com. Thanks! Hi. Would it be possible for you to send me the polynomials maze also? I love that idea.